Mindblowing Magician Kevin Cann is one of the UK\'s top wedding magicians specialising in close-up magic for stand-up drinks receptions as well as table magic during the wedding breakfast. 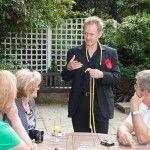 Kevin combines magic, mystery, mindreading and comedy to give your guests a uniquely entertaining experience that they will never forget. Ideal for entertaining your guests during photos (which can last up to 2 hours) or while they wait to be served each of their courses during the wedding breakfast or during the quiet time between the afternoon and evening receptions. Experience the Impossible with Kevin Cann !